n today’s world full of colors you probably think that there isn’t any place for a monochrome machine in the office, we thought the same before we received the Brother MFC-8950DW for a test. Here it isn’t about colors, it’s all about functionality, high speed and high-volume printing. This laser monochrome, multifunctional and extremely powerful printer is made to handle a high volume of work. It features a quite specious 500-sheet input tray. But if you need it you can even purchase a second 500-sheet paper tray and thus provide the machine with over 1000 sheets of paper at a time. And if this is not a pretty good optimization of time! The printing speed is up to 40 copies per minute. The toner cartridge is also a pretty spacious storage, it provides up to 12 000 pages per cartridge. Impressive right? Brother rates the machine’s duty cycle at up to 100 000 pages monthly. For them you can choose between three types of printing resolutions: 600×600 pixels, the standard 1200×1200 and the HQ when you have 2400×600 dpi. All of this functionality comes in a pretty compact shape that almost resembles a square but is pretty interesting with the two colors combined and the smooth lines and curves. The exact numbers are 491mm width, 415 mm depth and 477 mm height, the weight is 17.7kg. 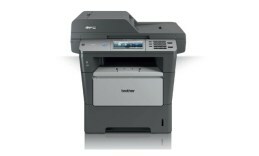 Its functionality is quite large: you have an automatic two-side printer that saves half of your time. Along with this with Brother MFC-8950DW you can scan, copy and fax your documents and you are in charge of all this wirelessly. The sensor display is intuitive and allows you to easily control the work processes of the printer.